Gay looks good on Irish 🙂 Link to purchase this shirt is at the bottom of the post. Or you can click the shirt itself! Easy. Happy St. Patrick’s Day guys! Are you going to the NYC parade today? I never really understood what St. Patrick’s day was about besides the color green, leprechauns, the irish folks, beer, and anti-gay controversy….so I took a quick look at wikipedia. 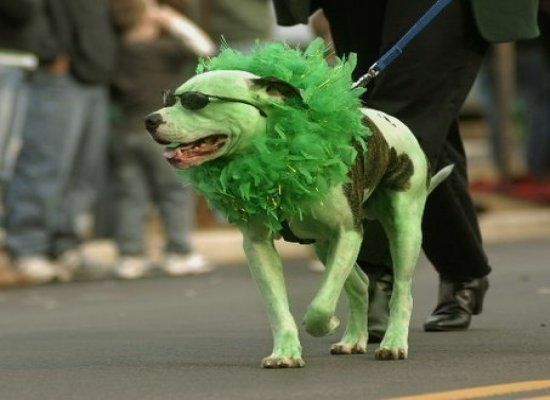 New York City has the largest Saint Patrick’s Day in the world. On average, 150, 000 marchers participate. There are social and cultural groups, politicians, firefighters, emigrant societies, bands, military and police groups, and about 2 million spectators lining the streets. It is a 1.5 mile march that travels along 5th Avenue in Manhattan, and takes 5 hours! It is always led by the U.S. 69th Infantry Regiment. The Commissioner of the parade always asks the Commanding Officer if the 69th is ready, the traditional response is “The 69th is always ready.” Cool. I would have never known this because I am usually too busy complaining that the green parade is interfering with my television show. It started as a yearly Catholic based holiday, named after one of the most recognized patron saints of Ireland, but has since become a celebration of Irish culture. Kinda like how churchy Christmas became more fun. Mr. Saint Patrick was born into a wealthy family in Roman Britain, who were very into the church, and when he was 16, he was kidnapped by Irish raiders and sold into slavery. Like a cop raid, except they confiscate the Irish. Very a’la Joan of Arc, he heard “God” speak to him and tell him to flee back to Britain. He immediately started studying to be a priest, then traveled around as a bishop, spreading his word. Eventually he “saved” the Irish by converting royalty, the rich fancy people, and the poor to Irish Christianity. He used the shamrock to explain the Holy Trinity (Father, Son, Holy Ghost, Amen). The original color associated with Mr. Saint Pat was blue, but I guess the shamrock made the people prefer green. Makes more sense to me too. 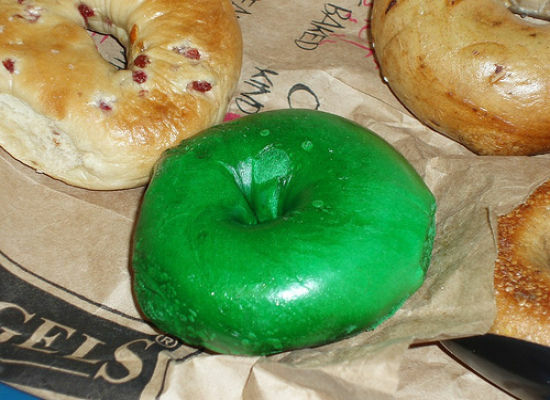 The Most Ridiculous Things Dyed Green For St. Patrick’s Day (PHOTOS). I am not a fan of dying animals, but he is chillin. 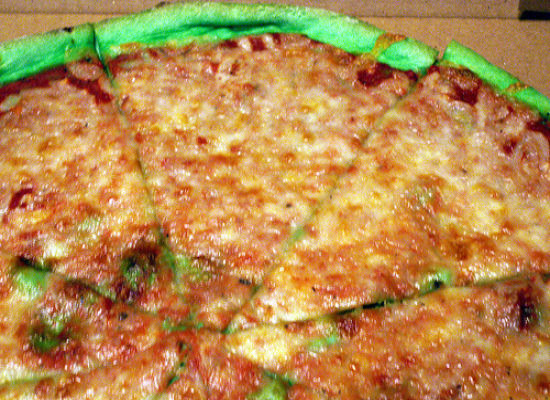 Green Pizza! Interesting…find it at Don’s Pizza King in Belmar, New Jersey. Green hoofs. 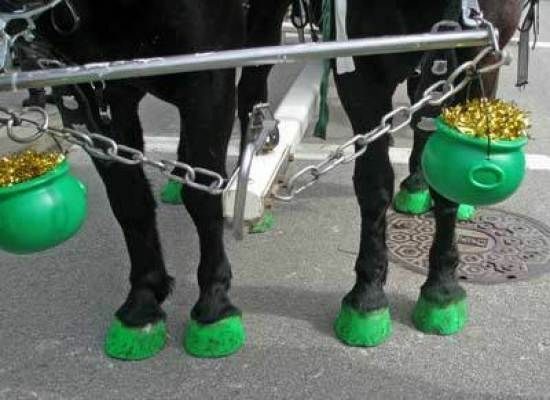 Who said the horses want green hoofs? They are probably getting teased by all the other animals for looking silly. And they have the nerve to be carrying pots of gold too. Giddy O’Up! 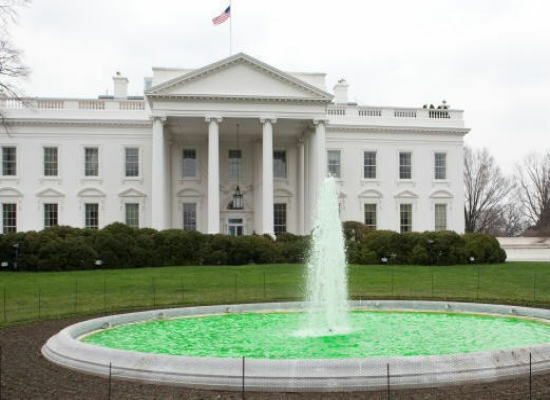 Last year, the Obamas’ had the front fountain dyed green for the holiday. 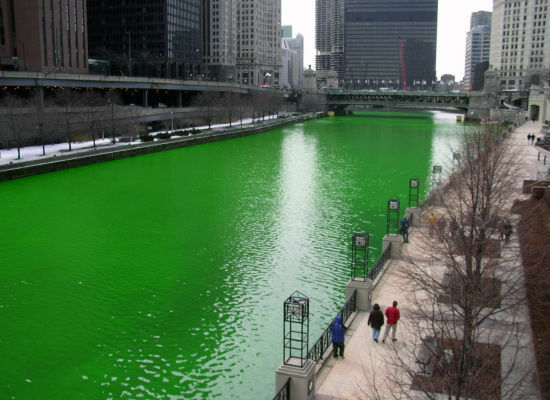 The Chicago River is dyed green every year for the holiday. Cool. I would like to see this in person someday. But are they sure this is healthy for the environment below? 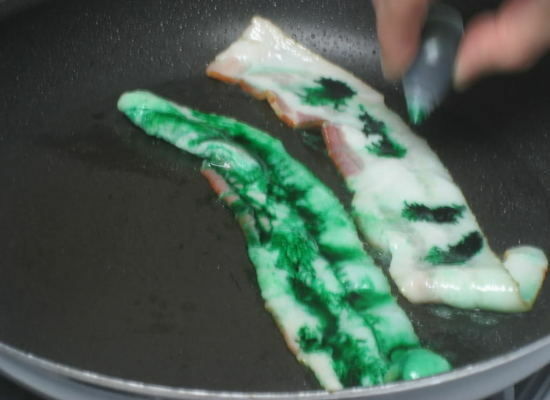 Green bacon? I’m in. As long as it’s all food coloring. 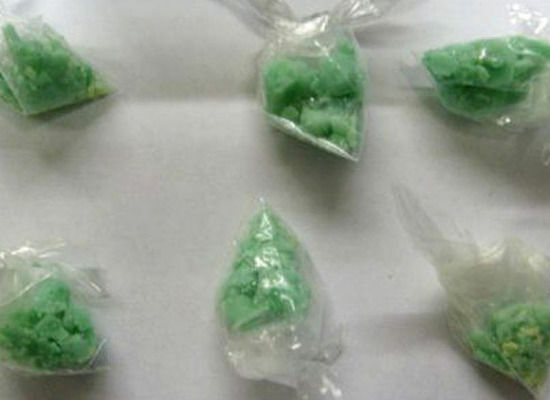 On Patty’s day in 2008, Ohio police did a crackdown on green holiday crack. These dealers sure are becoming artsy-crafty. 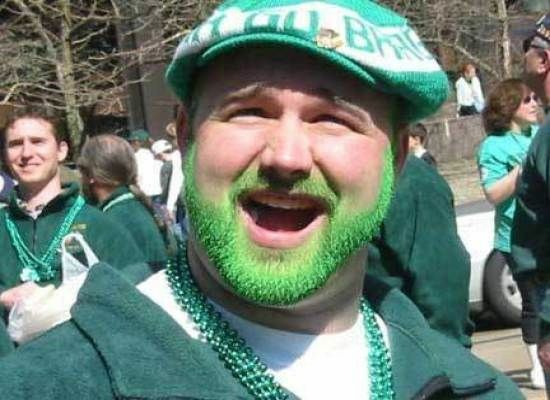 This green beard is a pretty good dye job. To purchase Gay-Ish shirt, click HERE. Make it a point to visit the Bronx Zoo. « (Photo): Neia Neia, quite contrary, how does your garden grow?